How can we attract young students to a career in science and how can we retain them? Those were the leading questions of the first workshop of the Bratislava Declaration of Young Researchers, held in Brussels in the beginning of the year. Initiated by the Slovak Presidency of the Council of the European Union (July-December 2016) and the Directorate General for Research and Innovation of the European Commission, the workshop brought together researchers from diverse career stages, including high school, undergraduate, PhD, postdoc and professor. At this meeting, it was not clear where this would all lead to, but despite our different experiences and backgrounds, we soon realized that we share similar problems and we all see the need of radical structural changes within the EU as well within the national research and higher education systems. Press conference on the Bratislava declaration. 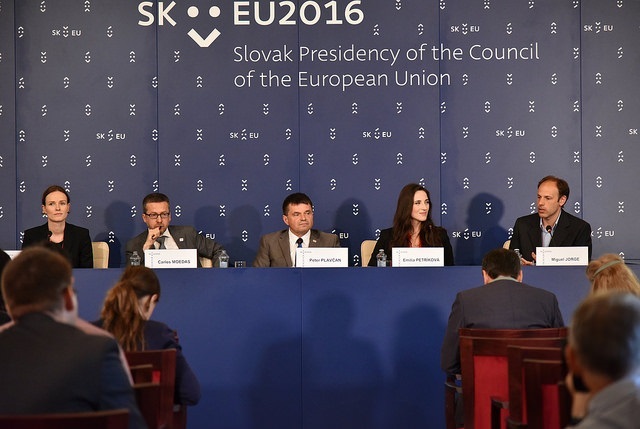 From left: Sarah Glück, author of the declaration; Carlos Moedas, Commissioner; Peter Plavcan, Slovak Minister; Emilia Petrikova and Miguel Jorge, authors of the declaration. Photo credits: EU2016 SK. – put in place mechanisms to facilitate and equally reward diverse forms of mobility. These issues are known for a long time but the high level of political attention and the inclusion of the Declaration in the Conclusions of the Council of Ministers are novel. Furthermore, the Declaration highlighted the significance of including scientific methods and thinking early in school curricula, and aims at engaging individuals – before the PhD level – in research endeavours and constitute them relevant stakeholders in research systems. This initiative came from high level actors such as the European Commission and the Slovak Presidency, but soon was given into the hands of the researchers, who dictated the content. The encouragement of these high level actors to articulate our aspirations and concerns and their support throughout this process has enhanced our optimism that the Declaration could actually lead to addressing the issues raised at the level of national and EU policy makers. The content of the declaration was influenced by a survey from the Young European Associated Researchers network YEAR. This survey provided an insight into the obstacles young researchers face, the reasons for becoming a scientist and the extent of satisfaction with their current situation as researchers. The main ideas of the Declaration were then presented and discussed at the Young Researchers Conference 2016 in Brussels on 13th June together with representatives of research (funding) organisations, the EU Commission and the Slovak Presidency. This Conference enabled the authors to consult different stakeholders and get useful feedback which clarified further the content of the Declaration for the meeting with ministers. At the informal meeting of the Council of Ministers on 19th July 2016 a representation of the authors of the Bratislava Declaration of Young Researchers were then invited to present their concerns to the ministers and ask for their commitment to support the Declaration. The ministers welcomed this initiative and engaged enthusiastically with the authors acknolwedging the significance of the challenges and aspirations. They were thus asked to endorse the Declaration as a whole and include it it the Conclusions of the Council of the Ministers, which will be adopted on 29th November 2016. During the preparation of the Bratislava declaration. From left: representatives of the Slovak Presidency Daniel Straka and Andrej Kurucz, authors of the declaration Lynn Kamerlin, Emilia Petrikova, Charoula Tzanakou, Bruno Gonzalez Zorn and Miguel Jorge. Photo credits: Dusan Sandor. Since then the group of researchers authoring the Declaration have undertaken various efforts to enhance the visibility of this initiative, engage individuals, relevant staekholders and policy-makers to support the Declaration and identify ways for its implementation. Considering the urgency and importance of this issue, we would like to involve individuals who are affected by the current research and (higher) education systems and those who are able to change the situation, namely EU and national politicians, as well as research (funding) organisations and higher education institutions. Therefore, we have developed a website with the Declaration where it can be endorsed. So far around 400 signatures and 100 comments of interested and supportive researchers and research organisations have been reached. We hope that the next European Research Framework Programme would reflect most of the issues addressed in the Declaration, to ensure that the next generation of researchers will be able to pursue their research endeavours and to establish research systems where care and responsibility towards young researchers is at the heart of such systems, implemented in national and EU legislation. A recurrent question we get is who are the young researchers the Declaration refers to? There was a great deal of discussion about what a young researcher is and the dimensions of age and career stage were central to this. However, we soon realised that this could become a minefield. Some of the authors of the Declaration are young in age and have started conducting research at high school and/or in their undergraduate studies so this term would be inclusive of them. The issues that the declaration brings up are especially problematic for researchers at their early career stages due to the lack of experience, contacts/networks and they need to be supported, trusted and cared for in a special way. But the structural barriers the declaration tries to emphasise on, are an obstacle to any researcher and the discussion until which exact age a researcher is young and therefore covered by the declaration isn’t taking anyone further. It is hoped that this initiative will be the starting point for a continuous dialogue between young researchers and policy makers about the future of science and research. From our personal perspective, we think that “young” researchers should be involved at an even more critical and challenging stage of such initiatives which is the implementation and fulfilment of the aspirations described in the declaration. Sarah Glück is Research Fellow at the Zeppelin University (Germany). 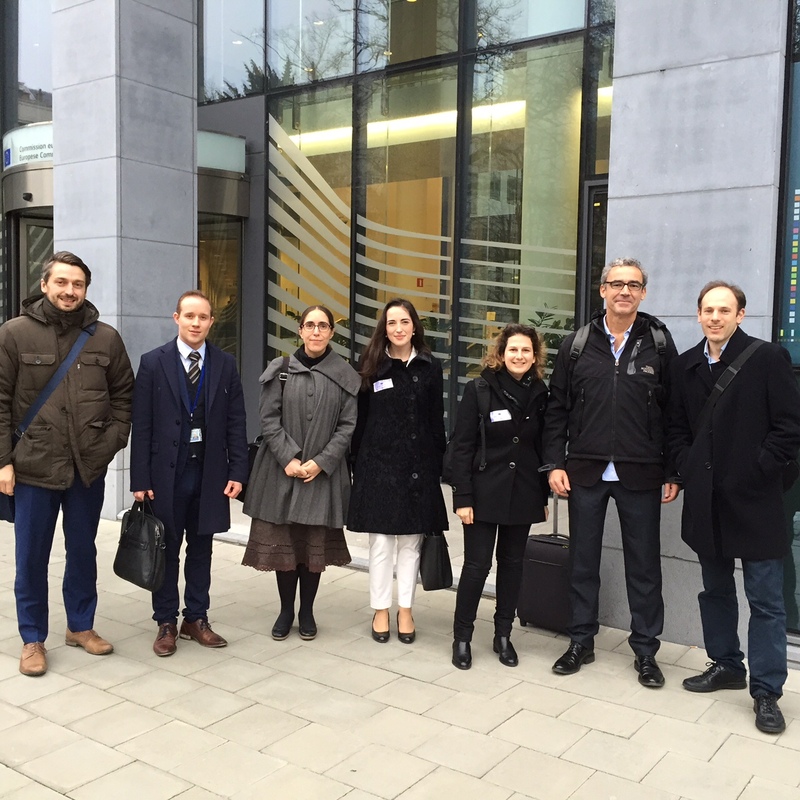 Dr.Charoula Tzanakou is Research Fellow at the Warwick University (UK). They both are among the authors of the Bratislava Declaration. The content of this blog represents only the opinions of the both above mentioned authors. [i] Sarah Glück and Charoula Tzanakou are among the authors of the Bratislava Declaration of Young Researchers. This entry was posted in Current Affairs, Education, Politics & Public Policy, Publications & Events, Science & Technology, Teaching & Learning, The EU and tagged careers, Framework Programme, higher education, interdisciplinarity, mobility, Research funding, research impact, research policy, universities. Bookmark the permalink.